Techno Stamper: Let's get this party started! The Christmas party that is. 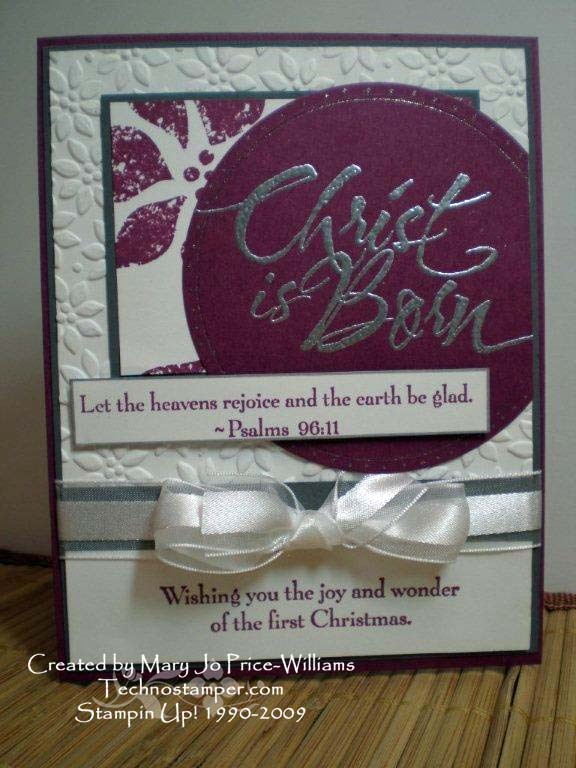 I so love Christmas--it is such a fabulous and exciting season. It is the birth of our Savior and there is much to celebrate. I for one will wish EVERYONE I see a Merry Christ-mas! I will not under any circumstance be forced to say Happy Holiday's. If someone is celebrating Christmas they should know what the holiday is--if they don't believe that is fine but that just means they are celebrating December 25th and should not call it Christmas! OK--my post on that for the year, lol! 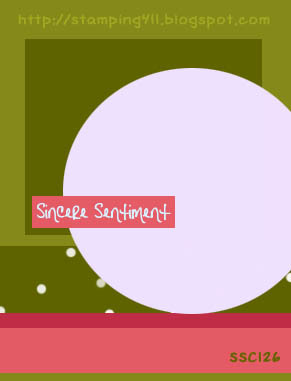 I have four more Christmas cards to share with you today. 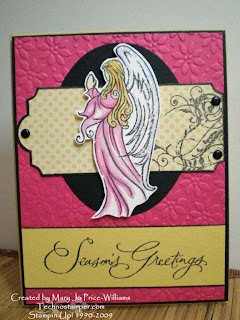 Remember the challenge on Latenightstamper's this week is to create cards for your favorite holiday--as you can tell this is mine. I send over 150 Christmas cards each year and my goal is to NOT send a different card to everyone. I am over half way there and here are four more. 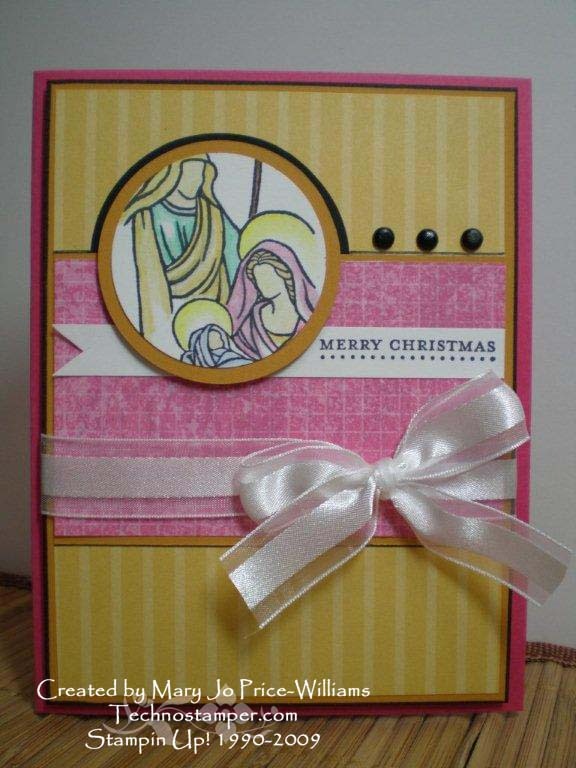 All supplies on all cards are current Stampin Up! products. This first card is for this weeks SCS sketch challenge. This next card is using the beautiful set Holy Triptych. I just love this Melon Mambo color for Christmas this year--you probably already figured that out though, lol. Stamps: Holy Triptych, Teeny Tiny Wishes. The next one up is the beautiful angel from the Holy Triptych set. And finally this is for today's 411 sketch challenge. Great sketch and one of my most favorite sets ever is being showcased here. Now I am off to sleep on a cold cement floor with my son and a whole bunch of other Scouts! We are visiting Old Fort Niagara and sleeping in there over night. Keep me in your prayers, lol! It is going to be VERY cold and my arthritis does not like that---ahhhhhh the things we do for our kids! OMG!!!! They are all so beautiful!!! Fabulous job. I couldn't pick a favorite if I had to. Thanks for taking the time to do Stamping 411 challenge as well. These are just gorgeous! I love your quote at the bottom of your blog entry, and I totally agree with Merry CHRISTmas!!! I bet the folks that request 'happy holidays' wouldn't turn down a nice CHRISTmas present!!! lol! Great job on your cards! WOW!!!!! They are all beautiful, but that white card takes my breath away. I was at walmart tonight and took a photo of a clothes rack that had similar colors, with the intention of making a card... Holy smokes, I love it! Happy Thanksgiving, and Merry Christ-Mas. These are wonderful, Mary Jo! I especially like the one done with the Stamping 411 sketch! Thanks so much for playing along this week. Gorgeous as always MJ! All of these cards are great, but I love your 411 card the best! It's fabulous! Beautiful cards! The Stamping411 sketch card is STUNNING! you are so talented and make such gorgeous cards. 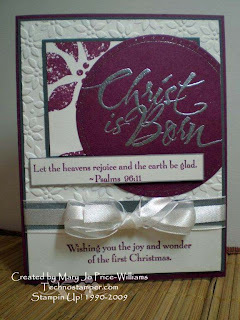 Congrats on having your card chosen for the Stamping 411 Stampers Showcase. It's fabulous! 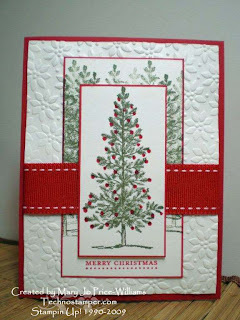 as a Tree card. The sweet layout is so perfect for this set. I just have to case you for my consider it cased week.